Facebook seems to have taken a cue from the fast becoming popular payment service Apple Pay. While it is a closely guarded secret as to how much money Apple makes for every transaction parsing through Apple Pay service, there is no doubt that with more and more transactions taking place, Apple is bound to make a lot of money out of it even if the transaction fees is a very small fraction of the total amount. 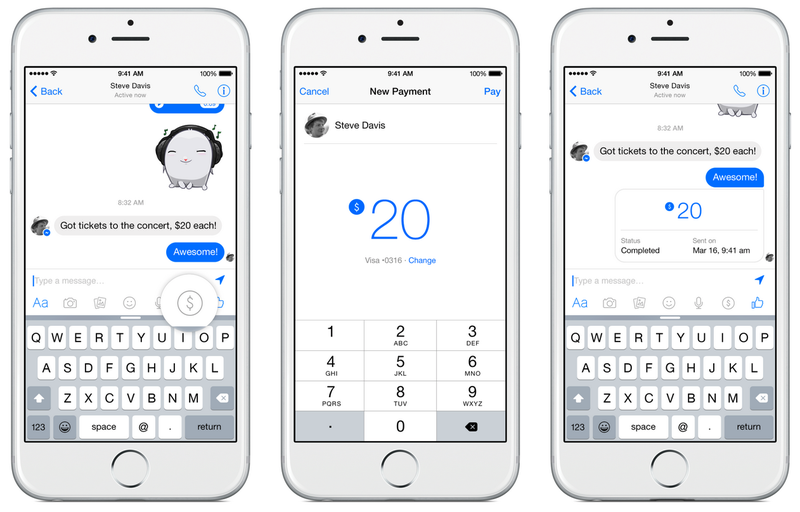 Facebook, arguably the most popular social media website has taken hints from Apple Pay and have quietly rolled out their own payment transfer system via the Facebook Messenger app on 17th March, 2015. Before you get too excited about it, the first and foremost thing that you should keep in mind is the fact that this is currently only available for customers in the US and hopefully will be made available for other users in the future. How do payments over the Messenger work? As a prerequisite, you need to enter your card details on a desktop or laptop that opens the desktop version of Facebook. URLs starting from m.facebook.com will not work. Go to Settings < Payments < Payment Methods < Manage. Add your relevant card details and close the page. On your phone, make sure you have updated the Facebook Messenger to the latest version. For iOS devices, the latest build is Version 23.0 and 4.0 for Android Devices. Enter the chat with the person to whom you wish to transfer the money. Just above the keyboard, you will be able to see a $ symbol. Click the symbol, enter the amount and you’re done. For additional information, you can visit the Messenger’s in-app help center by going to Settings (you must be in the home screen of the app where you can see all contacts) < Help < Payments in Messenger. The page details a list of helpful FAQs that can answer a lot of your questions. Currently, Facebook has decided not to monetize the service and there will be no charge per transaction on any amount of money that you send. Over the years the Facebook Messenger app has made serious gains in its amount of functionality with the app being a source for free calling, voice messaging and now transferring payments. Facebook can be extremely successful in terms of revenue once they start monetizing the service and release it to users worldwide. This is a great news for sending payment, great.